If you are like me and love teeny tiny one bite desserts these will be right up your alley. 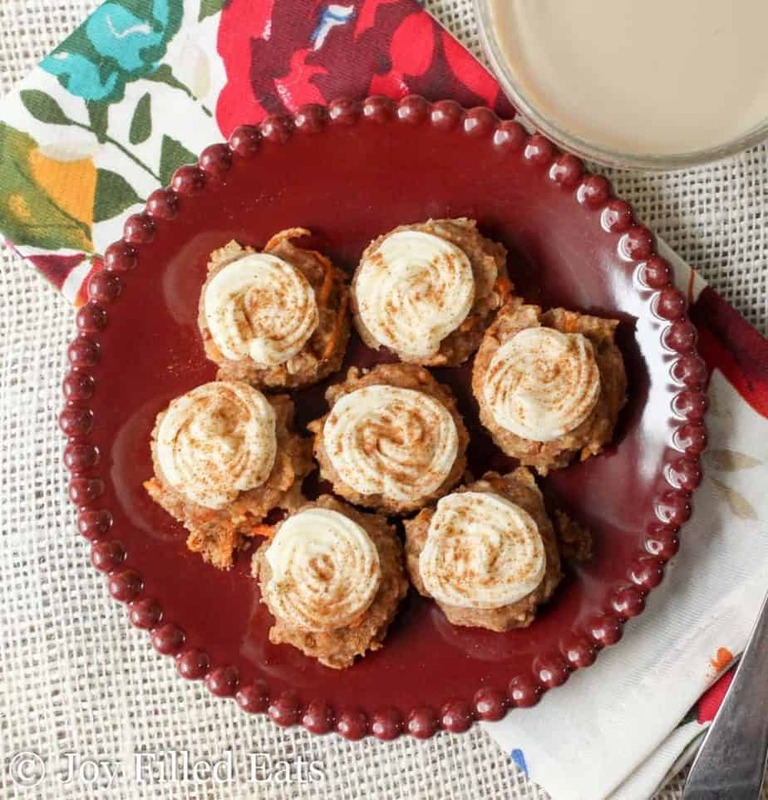 My Mini Carrot Cake Cookies with Cream Cheese Frosting are bursting with flavor in each little cookie. Carrot cake is one of my weaknesses. Store bought cakes don’t really appeal to me. They generally taste fake and overly sugary. I moved past wanting to eat the bright pink icing flowers long ago. The exception is store bought carrot cake. Maybe they use more real ingredients or maybe it’s just the cream cheese icing but when I see one of those it is very hard to resist a piece. With my due date a week past and baby still cooking in my huge round belly one of the ways I’ve been nesting is by baking. The funny part about this recipe is I didn’t set out to make cookies. I set out to make a copycat recipe for the Keto Love Carrot Cake Almond Butter I love so much. I’m not sure where exactly I went wrong but it started looking more like cookie dough than almond butter and I decided to throw in some egg whites, bake it, and see what happened. 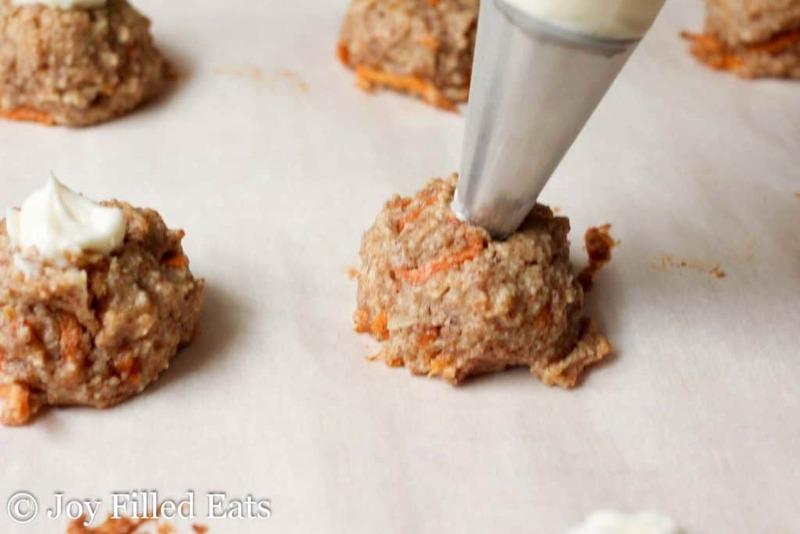 Perfect carrot cake cookies are what happened. My original batch made about 80 cookies. I decided to scale down for you guys because 80 seemed like a few too many. But if you want to double this recipe to get 80 cookies go for it. 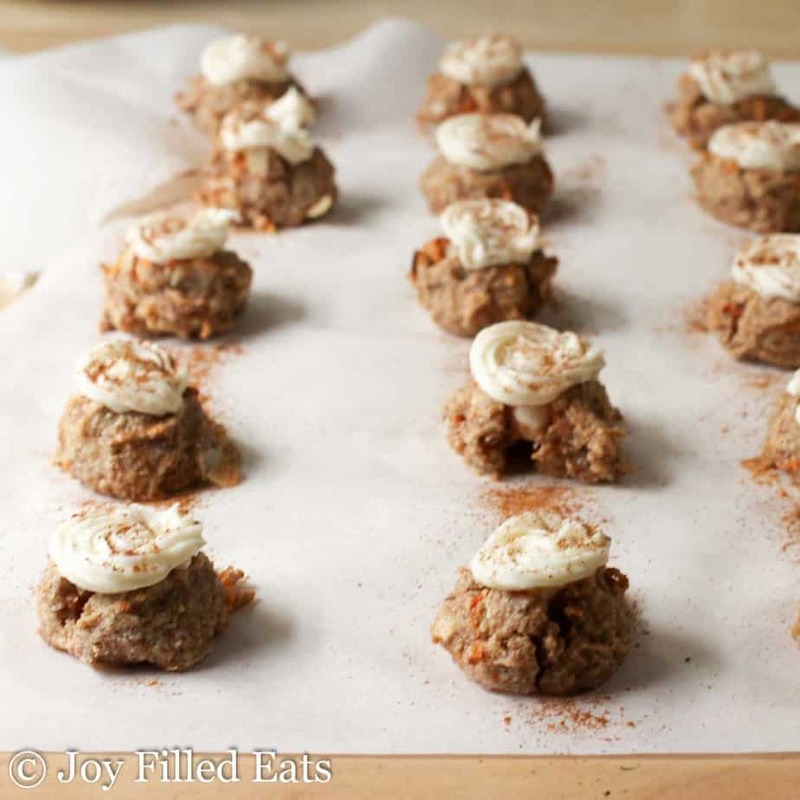 It would be perfect if you need to bring a lot to a cookie exchange or big party. 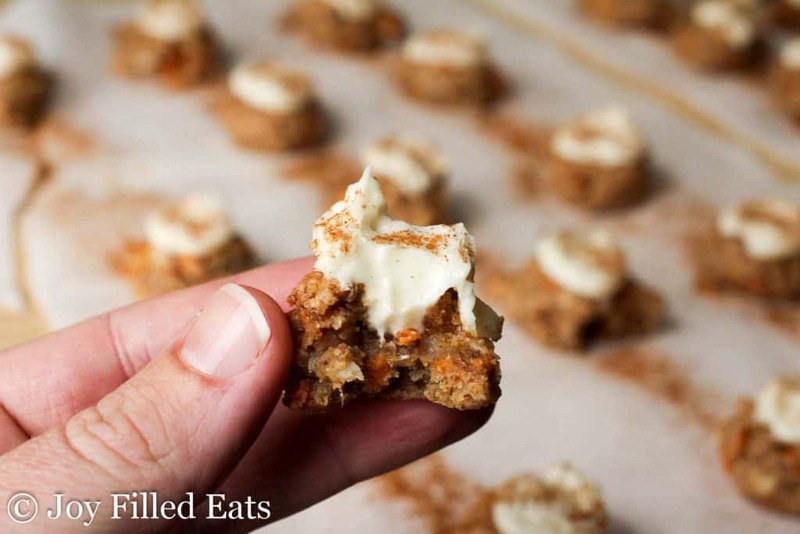 The gluten-free carrot cake cookies themselves are not overly sweet. Most of the sweetness comes from the icing. If you decide to skip the icing, for whatever reason, I would suggest increasing the sweetener amount in the cookie. 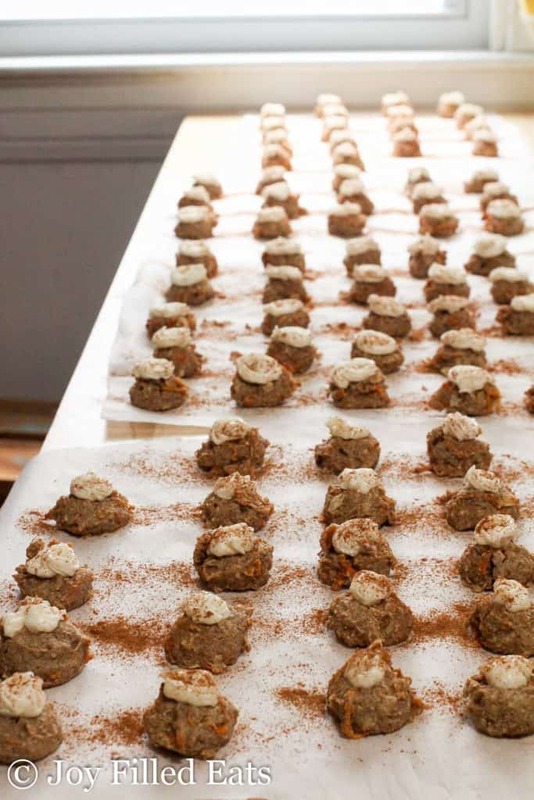 In case you were wondering I did end up stacking these carrot cake cookies successfully with parchment paper between them. The cream cheese frosting got a little smushed but still looked ok and they still tasted great. Below is my original batch of 80-ish cookies. I froze some but we ate most of them. I had them for breakfast a few mornings with my coffee. Best breakfast ever. If you are like me and love teeny tiny one bite desserts these will be right up your alley. 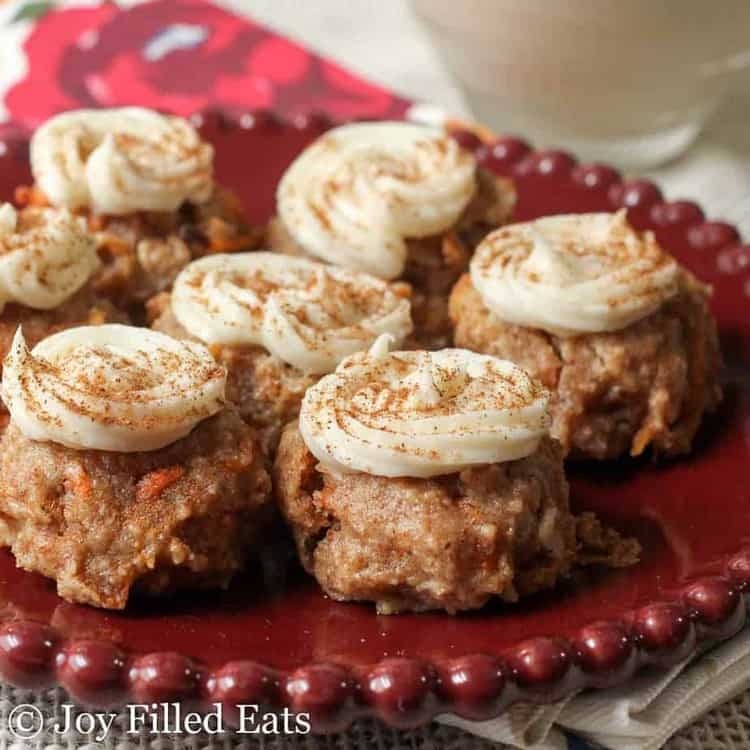 My Mini Carrot Cake Cookie Bites with Cream Cheese Filling are bursting with flavor in each little cookie. Preheat oven to 350. Line two large cookie sheets with parchment paper. Process the almonds in a food processor until they start to break down into a nut butter. Stop the machine and scrape the sides down as needed. Add the sweetener, half and half, butter, egg whites, cinnamon, and baking powder. Process until smooth. 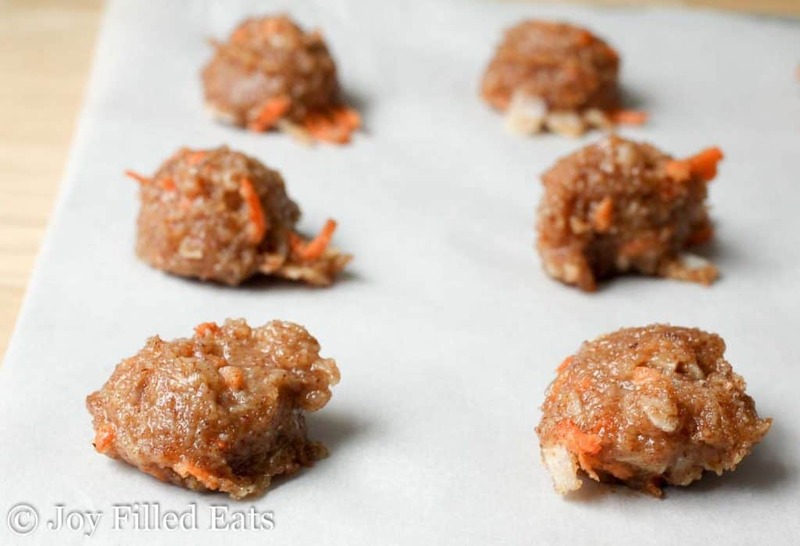 Stir in the carrots and coconut flakes. Using a small cookie scoop make about 40 cookies. Bake for 15 minutes or until firm to the touch and golden around the edges. Cool completely. Meanwhile, cream together the filling ingredients with an electric mixer until smooth. Put into a piping bag with a small round or star tip. Press the tip halfway down into the center of each cookie. Gently fill with the icing and then swirl on top. Could I make this into bars? I'm sure you could! I don't know an exact cooking time without testing it. My guess is 20 minutes. Oh wow! Just pulled these out and slathered the frosting on. Doo tasty! Used almond butter and it worked well! Husband has trouble with THM based baked goods. He loves traditional baking and said my cookie was missing a crisp crunch. I told him they were based on carrot cake then replied quickly with, "Then that's mighty tasty carrot cake." Winning recipe here. Thank you for sharing! has anyone tried to use zucchini in place of the carrots? These are sooooo good. I just made my second batch and always double it. My husband loves them! Thanks! I don't like coconut at all!! What could I sub for that and keep it low carb? Or could I just leave it out? You could leave it out but I'd probably use sliced almonds to give these a little more texture. Hi there! 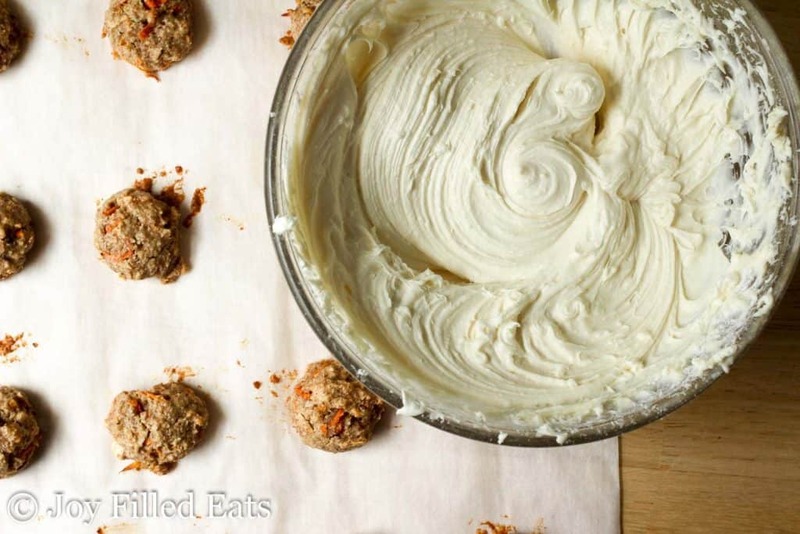 Do you recommend using raw or roasted almonds for this recipe? I plan on making these today :) Thank you! Is the sweetener you use 1:1 sugar? I have Lakanto, Swerve , and Sukrin sweeteners that I would like to use and math is not my strong suit , lol. Can you help? No, it is twice as sweet. If you use any of those you will need 1.5 to 2 times the amount listed. It is not as sweet as the sweetener I use. These are so tasty. I thought about adding ginger (either ground or fresh) next time I make them. Thoughts? What would that do to the carb count? A little ginger will not affect the carb count. You'd have to use a ton to change the nutrition facts. I’m not a fan of coconut, could I sub in GF oats? Yes, that should work as long as you aren't trying to keep these very low carb. In lieu of crushing two cups of almonds, how much almond flour would you estimate is necessary? Thanks! 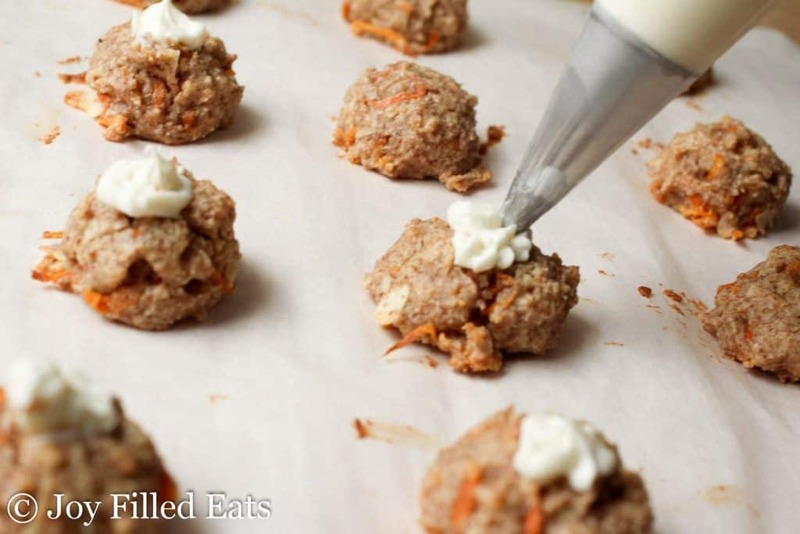 I like the slightly coarser texture of using a nut meal instead of almond flour in this. But almond flour should work. Try half the amount called for and then check the consistency. Thank you for your hard work. I really appreciate it. What can I sub out the half and half for? Heavy cream or almond milk should work. How can I sweeten these with natural sugars? Apple sauce, maple syrup, honey,.... I do not eat or use chemical/fake sweetners and don't like the flavor of stevia. Ideas? Thanks! Coconut or maple sugar would work. A liquid sweetener may thin the batter too much. Thank you so much for your response. I'll be trying these out soon with almond butter!! These look amazing!! I'm wondering if starting with almond butter would work--then just mix in other ingredients as listed. Any thoughts you have on that would be wonderful!! Thank you for all the time and effort you put into your recipes. It sure makes it easier for me! I think so. Two cups of almonds equals about one cup almond butter.